A poorly designed log deck results in tedious and labor-intensive firewood processing. The log deck is arguably one of the most important features in a firewood processor and a key ingredient in streamlining your process. Without a log deck it is impossible to unlock the full potential of your firewood processor. Home-built log decks tend to lack the most essential features required for high productivity and user ergonomics. A log deck that requires frequent filling consumes time and increases labor costs. Accidental infeeding of multiple logs causes production breaks. Knotty and curved logs might get stuck in a conventional infeeding chain and infeeding grapples are slow to use. 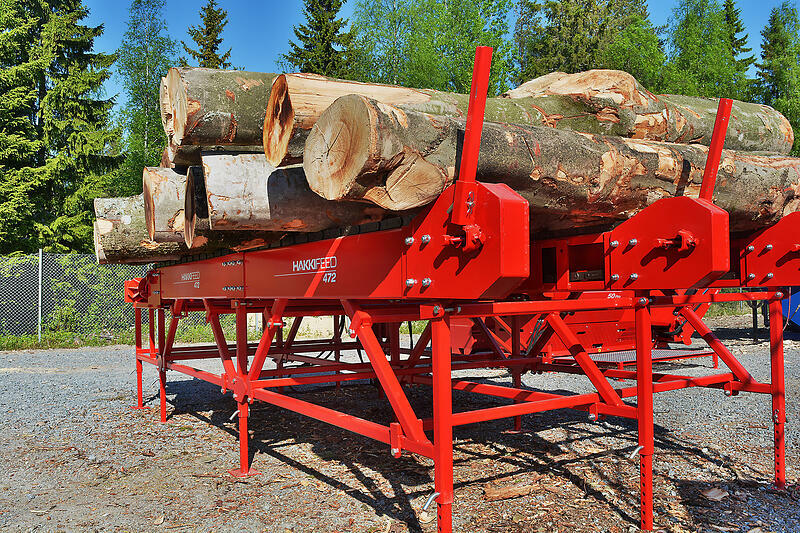 Hakki Pilke processors are equipped with log decks that address these issues with cutting-edge solutions making your firewood processing a breeze. We’ve addressed the issue of decreased productivity by designing an extendable log deck that is two to three times the size of a conventional log deck. Our solutions allow for logs to be piled in several layers. This helps save time as it requires less frequent filling of the deck and minimizes the amount of production pauses. Hakki Pilke processors are designed with features that allow for operating the deck and separate logs with a joystick without having to step away from the processor. Our log stoppers and other dispensation features prevent the accidental simultaneous infeeding of two logs. They are also capable of handling logs that are piled in layers. Our log decks feature a durable design that is well-suited for large and heavy logs. Three infeed rollers that are synchronized with the processor’s own infeed conveyor allow the processing of long poles and enable full control of knotty and curved logs. Always load the log deck so that the stump end goes in the processor first. This allows better weight distribution when feeding long logs up to 30 ft. It also leads to better firewood quality as logs tend to split cleaner and with less force when placed bottom first for splitting. We have developed a simple questionnaire to help you find the right firewood processor for your needs. Read more about the cutting-edge solutions Hakki Pilke has to offer by visiting our website.